You know the status of women in late night TV is bad. We took the GenderAvenger Tally tool for a spin to show you just how bad. Historically, currently, and across the board, women are absent from the 11:00pm–2:30am time slot. After last week’s announcement that Jon Stewart is leaving his 16-year post at The Daily Show, the wacky world of late night is being debated again. Like Letterman’s retirement or Colbert’s change of scenery, this moment revives the perennial question: where are the women in late night TV? The data, visualized through the GenderAvenger Tally, shows women are — and have been — almost completely absent. This opening at The Daily Show creates a giant opportunity to make change. While the late night debate rages on, use and share these images, or create your own, to send a clear message to Comedy Central that the public is ready for a woman to host The Daily Show. There are still ZERO female late night TV hosts. Yikes again. Okay, let's put everything together. Let's use the most generous description of late night that you can possibly run with. We’re going to include all of these channels and anything that airs in what’s defined as the late night time slot, 11:00pm to 2:00am. This includes programs that the average viewer might not classify as late night, like late night news programs or the late night comedy show Inside Comedy. That’s sure to change our pie chart, right? That slight sliver of the pie is thanks to Juju Chang, one of three anchors who hosts Nightline, and Reena Ninan, host of World News Now on ABC (which, though sometimes listed with other late night shows, airs at 3:00 am, and a more standard classification for it would be an “overnight news program.”) This definition is generous… and still only brought in two women. Has it always been this way? 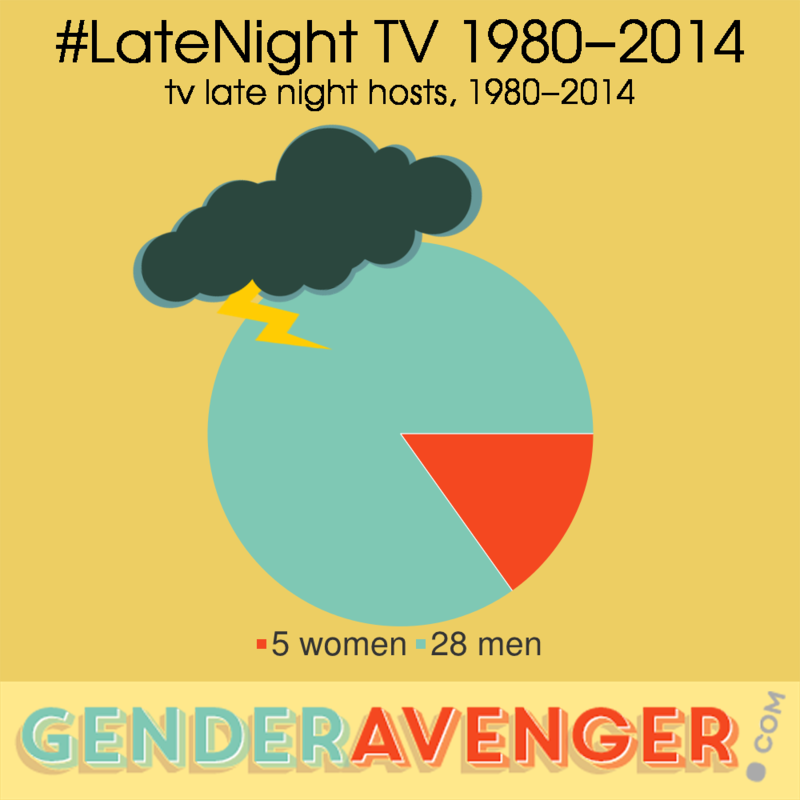 This pie chart covers 33 hosts of late night talk shows after 1980 that are no longer airing. The five women shown here are Kathy Griffin, Wanda Sykes, Chelsea Handler, Mo’Nique, and the late Joan Rivers. Again, ZERO women. We love the men of late night, but it’s time to see a woman at the helm. Now you can make the point with our GenderAvenger Tally. It is super easy to use. Share our pie charts or create your own. Use #ComedyCentral in your images and actions or tweet them to @comedycentral. 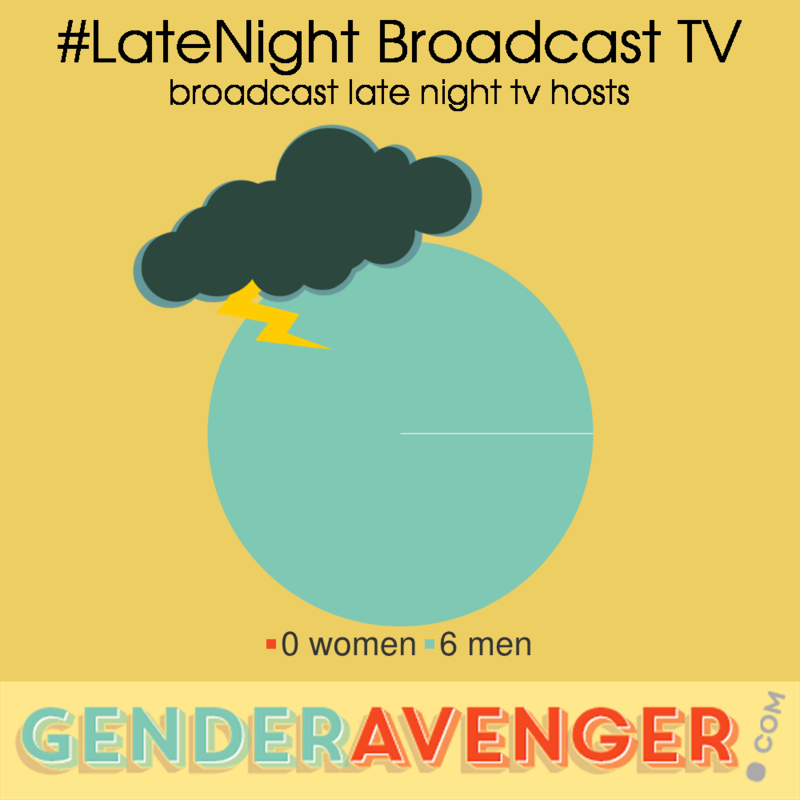 Click here to create your own pie charts, and make sure to tweet them to us using #GenderAvenger. We would love to see what you've created. Have at it!